The UAE national pavilion ... a rendition. Arabtec Construction will build the UAE’s national pavilion, which will be the main platform at Expo 2020. 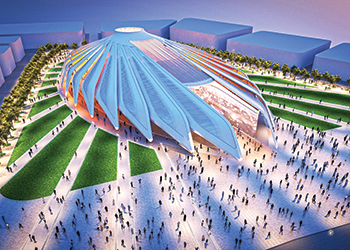 Arabtec Construction, a wholly-owned subsidiary of Arabtec Holding, has been awarded the main contract to build the national pavilion for the Expo 2020 Dubai, the first mega-event of its kind in the Middle East, Africa and South Asia region. The contract was awarded by National Media Council, the government entity responsible for building and operating the UAE Pavilion, to Arabtec after it emerged winner squaring off against three local and international companies in the final round with nine companies bidding initially. The UAE pavilion will form the main platform at Expo 2020 Dubai as the country is set to welcome nearly 25 million visitors from more than 180 countries. It will be built and operated to the highest standards of sustainable construction, aiming to achieve the highest Leed (Leadership in Energy and Environmental Design) rating. World-renowned Spanish architect Santiago Calatrava has already been chosen to design the pavilion, following a global design competition that saw nine of the top international architectural firms submit 11 designs centred on the concept of sustainability. Calatrava’s winning design draws inspiration from a falcon in flight. The UAE Pavilion is strategically located opposite Al Wasl Plaza in the centre of the 4.38-sq-km exhibition area. It will have several world-class features as well as special showroom zones and VIP areas. The pavilion is set on an area of 15,000 sq m with a total built-up area of 19,200 sq m. The upper floor of the pavilion spans an area of 2,000 sq m while the mezzanine floor will have an area of 662 sq m. The ground floor, with gardens and parking spaces, sprawls over 13,300 sq m. Another 3,000 sq m will be set aside for a plaza level and related facilities. Work on the pavilion will start this month for completion by the end of 2019.